Things will certainly be ramping up regarding the Zenfone 4 series as we head into late June and early July. Asus executives have publicly pinned the end of July as the release date. So the model A006 has certainly made various appearances lately. Let’s take a closer look. First, it appears to be a 5.2-inch device. In that way it does open the possibility as being a 1B type device. the 1A being a 5.5-inch device. Remember the Zenfone 3 main models came in a 5.2-inch and 5.5-inch size. The difference here though is the A006 model number seems to be on an island all by itself so perhaps it’s one-of-a-kind. The A006 comes with a standard FHD display of 1920 x 1080 resolution. This is a respectable resolution but it’s not so much a top end spec. When you’re at 5.2-inch perhaps a higher resolution is somewhat futile. We were expecting the Zenfone 4 models to go past a 1920 x 1080 resolution but price obviously plays into the decision. Performance wise, there appears to be a Snapdragon 820 @ 2.1GHz processor along with either 4 or 6 gigabytes of RAM. The benchmark test results can be a bit confusing in this regard. The storage appears set at 32GB. Cameras are good quality 21MP rear and 8MP front. Please keep in mind that the fine details or the specs are likely a bit inaccurate. 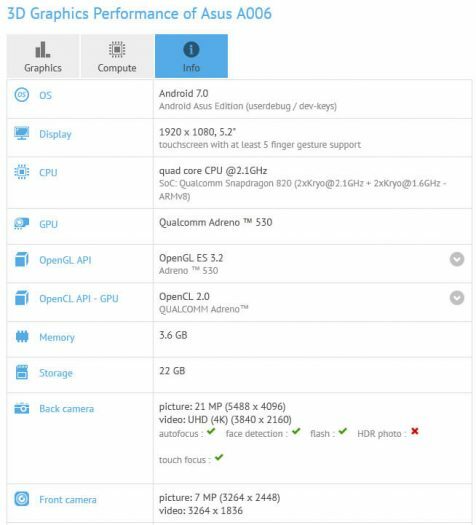 There is some evidence to suggest this is the Zenfone V model. It’s pure speculation as the what a “V” model entails. What we can say is that the Zenfone V is going to be mid ranged by the look of it. Could is be “5”? Unlikely as Asus has never gotten into roman numerals. Could “V” be for Verizon? Perhaps but the A006 hasn’t been through the FCC yet so we certainly don’t think it means Verizon. Remember the Zenfone AR is an upcoming Verizon exclusive so they will be marketing that phone over the next couple of months. V for Verizon seems a bit tacky in our opinion although it’s still a possibility.